Don't wait until the last minute to renew your .ca domain name. You've worked hard to make your .ca domain name known. Protect your .ca domain name registration by renewing now. Easy .ca Domain Name Transfers --- Transfer your .ca domain name registration to the #1 Registrar in Canada for .ca domains. Simply click on the button below to move your .ca domain name to us and enjoy the peace of mind from knowing your .ca domain name registration is with someone who cares. Need web hosting for your .ca domain name registration? We can set you up with a web hosting package to meet your needs for your .ca domain name website. Whether you need a small "mom and pop" business site or a larger business site, we can get you up and running with your .ca domain name web site in a jiffy. Check out our Web Hosting Packages and prices. Pre-book .ca domain names who's owners have let their domain registration expire and have not renewed their domain. Every Wednesday the Canadian Internet Registration Authority (CIRA) releases a block of expired domains that were not renewed by their owners within the allotted 30 day redemption period. Check out the current To Be Released List of .ca domain names and Pre-Book Today! Why a .ca domain? Why register with CADNS.CA? Be the first to register your domain name in both of Canada's official languages! 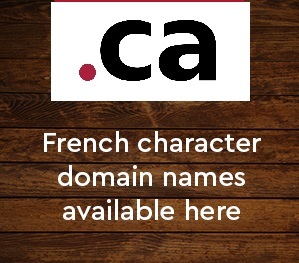 You can now register .CA domain names with the following French language characters: é, ë, ê, è, â, à, æ, ô, œ, ù, û, ü, ç, î, ï, ÿ. See our French IDN section of our FAQ page for information about IDN's and CIRA's bundling policy of your base English character domain name and all French character variants of that domain. New Global TLDs have been released! Don't miss out on the release of the new Global TLDs at a great price. Secure your new gTLD Today! What is this WHOIS thing? ... with every .ca domain registered. What's more, if you don't understand something, help is only an email away with fast turn around support. ... with every .ca registration. From your easy-to-use Control Panel, click on URL Forwarding; then enter the http://to.here/my.html in the URL Forwarding box. . Masking is included, if desired. You get an EASY Control Panel! ... we know you're looking for an easy to use Control Panel, intuitive and simple ... you've come to the right place. Begin your .ca domain name registration now! You get Fast, Friendly Service! ... from local people who take pride in doing their best for you, our customer. - Click the forgot login link to have the information sent to the email address of your account. Then you may log in to modify your .ca domain name. - Complete a manual administrative email change form to gain access to your registration account. Q. Have a question regarding your .ca domain registration? - Please check our FAQ page to see if it has already been answered. If your question can not be answered from that page please contact us via email or phone with your .ca domain name question.